In recent days employers have claimed that rising construction wages are a significant contributor to high prices in the residential and infrastructural sectors. Not only do these claims not hold up, they are crude attempts to divert attention from the real drivers of prices. The Construction Industry Federation (CIF) states that labour makes up 40 percent of the overall costs of construction (we will see below this is highly contestable). So if labour made up 40 percent of the original estimate of €980 million – that would come to €392 million. A 10 percent pay increase would add €39.2 million. Recently, Irish compensation has been increasing faster than our peer group (after a long period of stagnation). In 2018, Irish construction compensation rose by 4.1 percent; our peer group rose by 3.1 percent. But our employer class shouldn’t worry too much. At this rate, Irish compensation won’t catch up to the average until 2033. 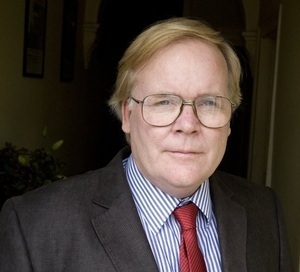 The CIF worries that higher wages will fuel higher house prices. But wages make up only a small proportion of the cost of residential and commercial construction. There are two ways to measure this: the production value approach (compensation as a percentage of production) and the value-added approach (compensation as a percentage of combined non-labour and labour costs). In both measurements, Irish proportions are much smaller than our peer group – meaning wage increases would have a smaller impact. 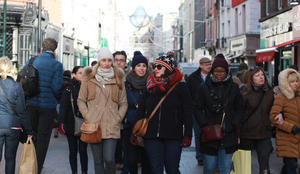 Not only is Irish employee compensation in the bottom half of the table in both measurements, this shows that employee compensation is between 16 and 22 percent of costs. The difference is that the production value includes value-added (that is, both wages and profits). This is a far cry from the CIF’s claim that wages make up 40 percent of costs. Here we go again. 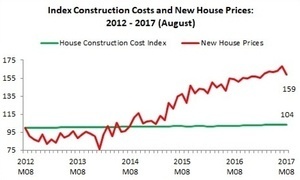 Between August 2012 and August 2017 (the last month we have data for construction costs), new house prices rose by 59 percent; construction costs rose by 4 percent. 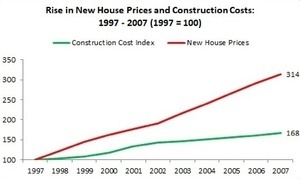 One more piece of evidence that house prices and construction costs don’t relate to each other. Here’s something provocative. The Labour Costs Index shows that construction wages rose by four percent in 2018. 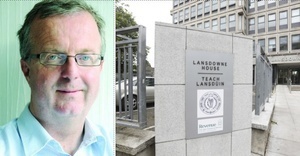 National new house prices rose by less than one percent; Dublin new house prices actually fell by four percent. I won’t suggest that if we increase Dublin building workers’ wages, Dublin prices will fall further. Instead, we see no relationship. Value-added is made up of two components – profits (gross operating surplus) and employee compensation. 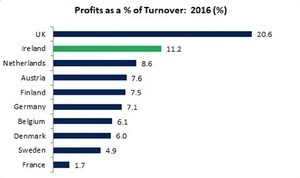 The higher the profit percentage, the lower the wage percentage: it’s a zero-sum relationship. 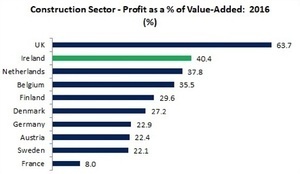 And profits in the Irish construction sector are doing quite well. 40 percent of value-added is captured by profits. This is lower than the UK – where low wages and bogus self-employment are even more than here – but much higher than a number of other countries. In short, the CIF is making disingenuous arguments about costs and ignoring the real drivers in prices. But there is a wider lesson here; namely, that government policy must focus on establishing a long-term relationship between house prices and construction costs. If prices mirrored construction costs since 1997, the average national house price in 2016 would have been €177,000 instead of the actual price – €314,000. Posted in Misc and tagged Taft on Thursday at 10:35 pm on March 7, 2019 by Michael Taft. The NCH gets unfavourably compared to the Burj Khalifa. The CIF must resent that they can’t get away with using slave labour to build this too. According to the CSO wages in the construction sector increased by 8.0% in 2018 and the average wage is €810.60 a week. 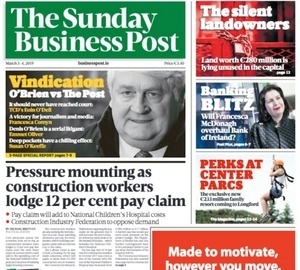 I’d be shocked if the construction industry keeps pay increases below 12% in the next 3 years. Average wages are increasing 3-4% a year. I’d say construction will be double that, an will increase by 18-24% in the next three years (if employers are lucky). I know that they’re expecting to be paying upwards of 30% more in direct labour by year end 2020. A number of small builders that didn’t survive the crash are PMs now in Dublin. 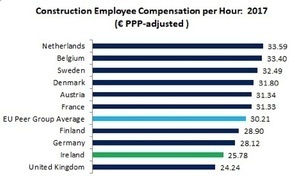 Why is it so much more expensive to build here than places like Germany & Austria if wages are lower? What percentage is land cost? This has never been explained clearly (to my understanding). Interesting, but I wonder why these costs are higher here than elsewhere? Is there anything that could be done (by government, say) to address the differential? literally wherever there’s an irish person setting a price for something it’s going to be too high. so with a whole country doing that, we end up being this insanely expensive sub-standard poopyhole. So sick of gougery. I guess we’re back to basic economics here. A vendor selling a scarce product will charge up to the level the market can bear. Builders might blame it on labour costs or VAT or planning difficulties, but they will jack up the price regardless. That’s why the central bank limits around mortgage lending are so vital.